Travel back in time to Charlestown, New Hampshire in the 1740's to visit an authentically reconstructed settlement. Tour with guides dressed as original settlers of No. 4. 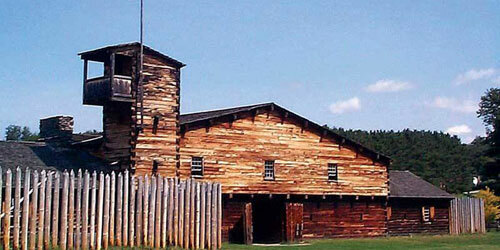 Demonstrations of hearth cooking, musket firings, military drills and much more are conducted daily. Hours: June-October, Wednesday-Sunday, 10 a.m.-4:30 p.m. Admission: Seniors age 55 and older, $7; adults, $10; youths age 13-17, $7; Children age 6-12, $5. 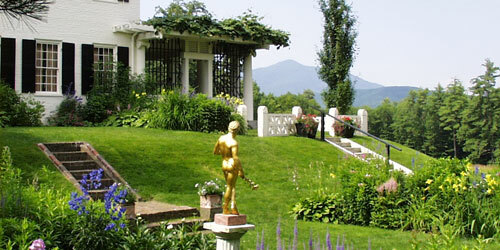 Discover the beautiful home, studios, and gardens of Augustus Saint-Gaudens, American sculptor. Over 100 of his artworks can be seen in the galleries, from heroic public monuments to gold coins. The property includes gardens and nature trails. Augustus Saint-Gaudens (1848-1907), created over 150 works of art, from exquisitely carved cameos to monuments. Works such as the Standing Lincoln monument and the Shaw Memorial continue to inspire people. Hours: Memorial Day weekend to October 31, ground are open daylight hours and exhibit buildings open daily 9 a.m. to 4:30 p.m.; November through late May, the exhibit buildings are closed, but the park visitor center is open most weekdays, 8:30 a.m.-4:15 p.m. Admission: Adults age 16 and older, $5. The Fells Historic Estate & Gardens is one of New England's finest examples of an early 20th-century summer estate. Come and discover 84 conserved acres of beauty and tranquility; learn the legacy of its founder, diplomat John Milton Hay, during historic guided tours of the 22-room Colonial Revival home; explore forest succession and nature's diversity while walking woodland trails; and enjoy the renowned gardens. Hours: The gardens and trails are open daily, year-round. The Shop and Main House are open 10 a.m.-4 p.m. in the following seasons: Starting May 25, weekends and Monday holidays; June 19 to Labor Day, Wednesdays through Sundays; week of July 4th, daily; September 7 through Columbus Day, weekends and Monday holidays. Admission: Adults, $10; seniors and students, $8; children ages 6-17, $4. The museum includes a village of 19th century buildings, 25 horse-drawn vehicles, and many artifacts of life in rural New England. Activities include socials, school visits, a holiday open house in December, and other special events and exhibits. Hours: Memorial Day -Columbus Day, Sunday, 12:30-3:30 p.m.; July-August, Tuesday, 12:30-3:30 p.m. Admission: Free; donations are welcome. Eighteenth-century farm house and residence of Daniel Webster as a student at Dartmouth College. The exhibits feature Webster's life and Shaker furniture as well as typical furnishings of the time. Hours: Memorial Day-Columbus Day, Wednesday, Saturday, Sunday, 2:30-4:30 p.m. Between Mascoma Lake and Mount Assurance, the Shaker community has existed for 200 years, reaching its peak of activity in the mid-1800s. Shakers practiced equality, celibacy, pacifism and joint land ownership. Today, visitors may tour the Great Stone Dwelling, the largest Shaker dwelling house ever constructed; examine exhibits of furniture, tools, clothing, and photographs; explore the herb and flower gardens; and enjoy concerts, guided tours and craft demonstrations. Some visitors hike to the Shaker Feast Ground for views of the Shaker Village and Mascoma Lake. The Museum Store sells Shaker-inspired reproductions, books, and farm products, along with produce from the herb garden. Hours: Open year-round; the museum is open Monday through Saturday, 10 a.m. to 5 p.m.; Sunday, noon to 5 p.m. Admission: Adult, $8.50; senior over age 61, $7.50; college students, $6; youth age 10-17, $4. This museum houses historic items from the 18th and 19th centuries. Of particular interest is a collection of Shaker items. Hours: July-October, Saturday, 1-4 p.m.
Interiors restored to the 1820 to 1840s period. A highlight of the tour is a restored faux marble floor in the entrance hall. The original English style barn contains 19th-century farm tools, 18th-century cobbler's bench, and an 1829 hand-pulled fire pumper. Guides discuss 19th-century politics, religion, women's roles, economics, banking, youth, education, household management, and agriculture. Cost: No admission charge; donations are accepted.